September 1990 issue of the American Magazine, Guitar For The Practicing Musician. 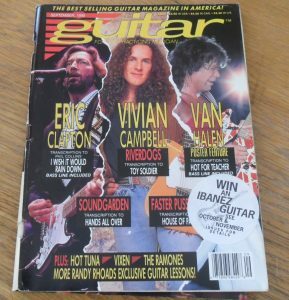 Featured in this issue are features on Eric Clapton, Vivian Campbell, Eddie Van Halen and many other articles and features. The magazine is in good condition, but slightly creased, with very little marking and wear to the corners (see photo). We will ship worldwide.. UK is only £2.50, Europe is £6, America and Canada £10..all other Countries please email for a quote.